BRAND NEW Shampoo and Conditioner from Philip Kingsley designed specifically for all variations of ethnic textured hair. The duo is based on 55 years of Trichological expertise, the duo are a first within the Philip Kingsley range to explicitly address the processing, styling and grooming needs of extremely porous hair and/or tight curls. This hair type is most vulnerable to damage and demands extreme moisture during the cleansing and conditioning process. In line with the styling needs of this hair type, the products can also be used on chemically processed and synthetic hair as well as extensions. MOISTURE EXTREME SHAMPOO provides a fine balance of cleansing performance and mildness. Designed to effectively clean the hair and remove all styling and conditioning products without stripping away natural oils . The formula contains a gentle detergent derived from Cocoa Butter to cleanse with a slight foaming action, whilst conditioning agents make hair manageable, easy to comb and leave the cuticle smooth. MOISTURE EXTREME CONDITIONER contains a blend of moisturising ingredients to nourish and repair the hair. The formula contains 4 natural oils including Almond, Wheatgerm, Avocado and Babassu which work together to condition the hair from the cortex to the outer layer, injecting intense shine without weighing the hair down. Avocado Oil contains essential nutrients and proteins that promote nourishment, while Babassu Oil works as a humectant with anti-static properties to leave hair soft and shiny. MOISTURE EXTREME offers a daily solution for those who want to care for and enhance their natural hair. Water is actually really healthy for our hair. Water is the best moisturizer for your strands and if you learn how to lock in the moisture from the water your hair will love you for it. First thing in the morning have two large 10 - 16 ounce glasses of water before you even brush your teeth. Let that water go through your system for the next 20-30 minutes before you have breakfast. Create a monthly routine you can be certain that your hair is never neglected. It also assures that your hair gets the right nutrients and care that it needs at the right cycle. When you don’t keep up a routine of care you are relying on a random approach to your hair care. Before long you have neglected to do the things which matter and suddenly start to see massive hair lost and hair weakness. Grow it Long - Click Here! Conditioning your hair is essential to any hair growth regimen. Conditioning adds much need nutrients to the strands. Some conditioners are designed to add moisture to your strands and those can be used to keep your strands supple adding more elasticity. damaging to your hair. More than one application can leave you with more hair in your bathroom sink than on your head. hair a healthy opportunity to grow. 2.) Depending on your hair type you may start with wet hair or dry hair. Someone people get a better look on hair that is towel dried. Others get good results with hair that has been slightly flat ironed. While others get very good results on wet hair. Experiment so you now what works for you. 3.) Get a good molding mud, or styling gel or Mousse. Put a little through your hair. 4.) Part your hair down the center. Then plait your hair in the way you would like the curls to flow. 5.) If you want small curls then about 8 - 12 plaits will do. If you want large curls, then about 4-6 plaits will do. 6.) Give your hair enough time to dry in the evening. 7.) In the morning unplait the hair but try not get the hair too frizzy. Separate the curls with your fingers and go. Take pictures so you can see resutls and have something to go back to otherwise you will forget. You may already know that blowing drying, flat ironing and pressing can be quite damaging to the health of your hair. Heat in general on a regular bases can case sever damage and breakage to coily hair. With that said there is one form of heat that is VERY GOOD for our hair. grow environment. What is really happening in the warmer months is that the warmth causes more circulation of blood to your scalp. More circulation means more nutrients are carried to the follicles giving your hair more growing power. Always protect your hair from the sun with a good hat so that your hair does not dry out or burn out under the strong heat. If you live in a cold climate you can duplicate the effects of this warmth in numerous ways to get the added benefits. AfroDesire would like to invite all current and future followers of AfroDeity and AfroDeityUK to use their special discount voucher. Just to start off with they have created a £5 off voucher with a minimum spend of £100. 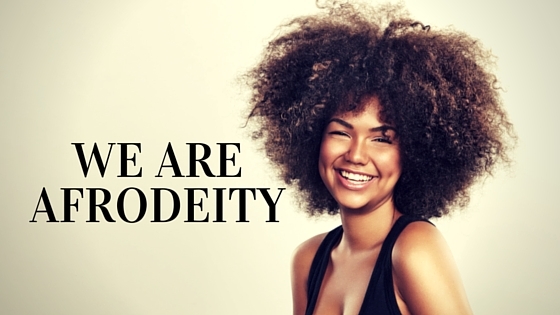 The discount code is: AD-AFRODEITY and that can be used during checkout on www.afrodesire.com.